Information you want to share with others, such as your interests or what you learned in class, or questions you want to ask readers are normally published as posts and not on a page. 2. Select Discussion and then click on Screen options to close. 3. 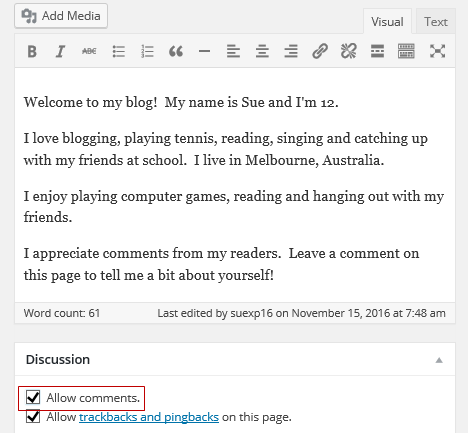 Scroll down to the Discussion module below your page editor and select Allow Comments. Honestly, it took a long time for me to figure out what I wanted on my site’s About Page. At first, I knew that I wanted a lot of information somewhere, but I didn’t know where to put it all. Then, I organized pretty much everything out of the About Page itself because I thought it was irrelevant and deserved its own category. That left me with a blank About Page. In the end, I just wrote a brief paragraph about what the site’s purpose is. I also mentioned where users can find the contact info of the club officers. Another thing: I have a full About category that features the general About Page, a page with the contact info of the club officers, a user directory, a questions page, and a meetings page that has all of the info about the month’s meetings. I went all out with that section. This step took more time than I thought. I wanted to make a good introduction of myself to the readers. I really enjoyed this step. I liked thinking about describing myself to someone who I’ve never met before and what the should know about me. This step was fun! For my About page I just put facts that I thought was interesting. I tried to elaborate more so whoever reading it could have more details. 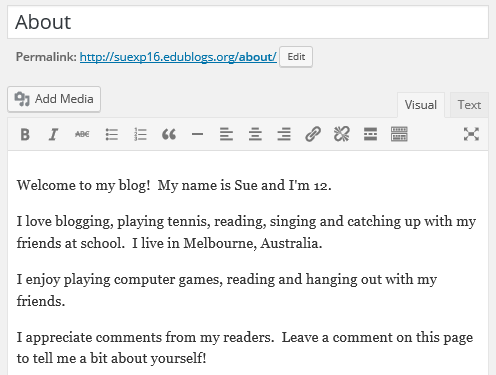 Great start with your blog, Ale! i explained what i would use to describe me and what i like to do. I followed the model and put my own information. The examples of the the other about pages were helpful and gave me ideas for my About Page. I wrote what came to my mind about myself and the things people would be more interested in reading. I did 5 thing about me because that’s my favorite number. Nice work, Jyn. You’ve certainly included some interesting info here! I would love to leave a comment on your page or post but it is saying I need a password to login. You might need to change your privacy settings or if your blog is attached to a class blog, then your teacher might have to change those settings. Hi I love to play video games and for fun I love to ride my four wheeler.And l play lacrosse. Lacrosse is an interesting sport! I gave it a try when I was a student but it’s not very popular here in Australia where I live. hi I like lacrosse also but Ive never played on a team before. I really want to know how. I just wrote what came to my mind that I wanted people to know about me! Thanks for sharing your About Page. Remember when sharing your blog URL to not sure the part at the end that says /wp-admin etc. That’s just for you when you want to access your dashboard. It sounds like you’re very busy with all your hobbies!